A simple sheep and what happens to it on judgement day. On judgment day, God sat on His throne and many sheep stood before Him in a single endless file. There were many countless white sheep, and there were more countless black sheep. When each sheep got to the head of the file it would suddenly come before a large golden mirror where it would behold the colour of its wool and then go and stand where its group stood. Many black sheep screamed in horror when they suddenly saw themselves and some tried in vain to join the group of white sheep willing their legs to walk in that direction, but somehow it was impossible for they always found themselves weeping among other weeping black sheep. And then there came a grey sheep. ‘What type of sheep is this?’ God asked. The angel Michael opened his mouth to answer but one of the twenty four elders stood from his throne and bowed before God. As soon as Traikai said this, the whole scene changed and the grey sheep found itself like a sort of detached consciousness in the mind of a white sheep that had its head lowered close to the bank of the stream called Warhmud stream. The white sheep had a look of indignation on its face as it listened to the words of five large, grotesque looking eels. And then the sounds of their conversation gradually became more and more audible to the grey sheep. The sheep had meant to ask them two questions. The first was why they wore snorkels when they could breathe perfectly under water. The second was why they seemed so determined in getting it to drink the putrid looking water. Presently a smaller eel began swimming towards the little group at great speed. It appeared it did not see the giant clam in its way for they collided violently, and the little eel’s snorkel went loose from its mouth. It opened its mouth to shout but gulped a mouthful of the water instead. The grey sheep saw the white sheep’s interest spike at the look of pure bliss that came over the little eel’s face before it fainted. The current brought the little eel to the foot of the white sheep where it bobbed up and down with the waves smiling contentedly at the upper atmosphere. ‘The bliss was too much for it to bear,’ the second eel said catching the little eel with its tail and flinging it back into the sea with a powerful twist of its body. The sheep stood for a moment reflecting and remembered clearly the Shepherds warning not to drink the water from the stream. In fact the Shepherd had warned them not to even wander close to the stream for any reason. Many times the white sheep had seen the Shepherd weeping over one of their number that had drank the water. At other times, they had seen the Shepherd prepare His boat and set sail on Warhmud stream to go and rescue a sheep that was crying somewhere. At such times the shepherd would hide the sheep under His clothes and take it to a stream high atop a mountain where He would bathe the sheep until its wool shone white again. ‘I have to return to my flock,’ the white sheep said, eyeing the water with what seemed like interest or curiosity. At this the five slippery eels burst into uproarious laughter. It seemed they had all been waiting to hear that. ‘The water is only the beginning of the pleasures awaiting you!’ an eel said, shaking with laughter and striving to keep its head above the water as it laughed. ‘It’s not just the water,’ another said chuckling as it descended again into the murky waters. The white sheep did look and saw what looked like a low hill appearing through the mist in the distance. And then a look of complete shock came over the white sheep. On that hill, gamboling around and around a gay looking shepherd playing on a flute were a number of white sheep. The sheep appeared completely care free and seemed utterly happy. It seemed just like the paradise the white sheep had long hoped for. A look of shock also came over the grey sheep as it looked farther down the sloping hill, farther down than the white sheep’s eyes could possible see. There it beheld the sheep, with full greedy looks occasionally tearing the luscious grass off the earth but going further down where the grass appeared even more luscious. Around a sharp bend the gay shepherd’s accomplice stood ready. As soon as a greedy white sheep rounded the sharp bend, the accomplice gave it a quick shove off the cliff and into the deeper and more disgusting part of Warhmud stream. As soon as the sheep hit the stream, it became blackened with the grime of the stream and had to swim on four legs to a small crowded island where many other sorrowful black sheep stood. The white sheep stood on its hind legs and stretched its neck to catch a last glimpse of the gay shepherd and his merry flock as they played going downhill and out of sight. ‘Such enjoyment,’ the lead eel said, also stretching its neck to take in the sight and holding two repulsive looking mugs full of the Warhmud water in both hands (somehow it had taken on the form of a dragon). ‘They are free to do whatever they wish.’ It turned to the white sheep and said, ‘I feel for you and your other ignorant friends. Your Shepherd restricts you too much. Don’t do this. Don’t do that. And what is the result? All of you wear long faces and come here to observe 'forbidden' enjoyment in secret.' It handed a mug to the sheep and the sheep took it in both its hoofs. It swirled the water around and around with a look of disgust on its face. The eel began to laugh, but stopped as suddenly as it had began. ‘Let me explain freedom – true freedom – to you,’ the eel said earnestly. ‘Those sheep you saw playing on the hill with their shepherd are the most fortunate flock of sheep you will ever see anywhere. They play when they want, eat when they want, sleep when they want, and do anything they desire whenever they want. There is no set time for play, or for sleep, or to refrain from feeding, or to bathe. They each determine what they will do, and they do it. There is no constraint. And of course there is no restraint. But most noteworthy is the fact that they don’t have to do whatever the shepherd tells them to do. Why? Because each of them is a master of himself. ‘You speak of returning to your flock because it is time you did. But here you can go and return at anytime you desire, and you will be welcomed.’ The eel paused and stared into its mug. ‘Sometimes I wish I were one of those sheep,’ it finished quietly, then lifted its mug and took a sip. The white sheep also lifted its mug, sniffed the water and then took a cautious sip. It was instantly flooded with strange sensations. The murky water tasted exceedingly sweet – too sweet – and it made the sheep giddy and light headed with a sort of pleasurable buoyancy. ‘Drink up,’ the lead eel said, smiling mischievously. The sheep was now too giddy to notice much. It threw back its head and gulped down the remaining contents of the mug. It was bending down to draw another cup of water when the Shepherds clear horn sounded calling all the sheep to Water Rock for the evening drink. As soon as the horn sounded, the eel dove, laughing, into the water and the sheep’s senses cleared. It was terribly alarmed at what it had done but turned and raced to join with the others at Water Rock. It thought to itself that it had committed a grave mistake by drinking the water the Shepherd warned them morning and night not to drink, but that it would keep the matter to itself and not go to Warhmud stream again. It had no idea that its wool was no longer white but that it had turned a shade of grey. As it ran its stomach rumbled violently and the terribly revolting after taste of the water of Warhmud stream caused it unspeakable nausea and disease. ‘Where have you been?’ the Shepherd asked as the sheep came up last of all to the group. ‘I fell asleep under the apple tree,’ the sheep lied. ‘No sheep that isn’t white is allowed either to drink from Water Rock or sleep in the safety of Fortrest pen. So since you are independent you will have to fend for yourself from now onwards.’ And with that the Shepherd led the other sheep through a secret place in the rock that the now grey sheep did not know or had somehow mysteriously forgotten. It searched in vain for the opening until midnight, then lay on the hard rock and began to weep. It thought to itself that it should have owned up to its mistake rather than lying about it. It remembered a few sheep that had committed great offences, but when the Shepherd questioned them, they immediately said they were sorry, and He pardoned them. If only the Shepherd would give it another opportunity, the grey sheep thought, it would say it was sorry. The sheep fell asleep on the rock and the grey sheep saw the gay shepherd and his accomplice come to where the sheep lay. They argued over what to do with it. The gay shepherd suggested they use it as a bait for other sheep, while the accomplice said that it should be cast immediately into the deepest part of the warhmud stream. The sound of voices roused the sheep and it started up in terror when it saw the two men. It screamed the Shepherds name as the two men reached for it. Then the grey sheep found itself back before the judgment seat. The ground seemed to shift beneath the feet of the grey sheep, and then it found itself falling from heaven like a meteorite. It fell faster and faster, and then it seemed to have been falling forever. It screamed and woke up. ‘Why did you drink that water?’ the Shepherd asked the grey sheep gently. It was dark and the grey sheep found that it had been sleeping on the rock in the same place where the gay shepherd and his accomplice had tried to kidnap it. 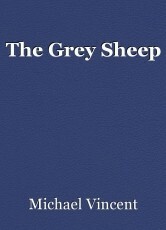 ‘I am sorry,’ the grey sheep said and wept, trying to hide its face between its hoofs. And the kind Shepherd carried the sheep up to the mountain stream. What a beautiful fable! Most of us are grey sheep, indeed... and require lots of washing. Wonderful work, Michael! Thanks a lot for your comment Oleg! I was struck with the idea to write this just before bed one night. I think many more stories address the sheep outside the flock, so this may be an additional one for those within.